It’s week 2 of the Spring 2017 One Room Challenge and I made some progress! I feel like I can’t waste any time with this space because I know every project planned will end up taking longer than I think. So this week I started right away by removing all my cabinets doors. Be prepared for a chaotic picture! It’s only been a couple days living like this, but seeing all the clutter is making me go crazy! I can’t wait to paint the cabinets and get them back together. I guess the good thing with this chaos it that it’s motivation! I also removed all the hinges and I plan on replacing them with a white semi-concealed hinge. My old hinges were starting to break, plus I painted them white which hasn’t held up at all. 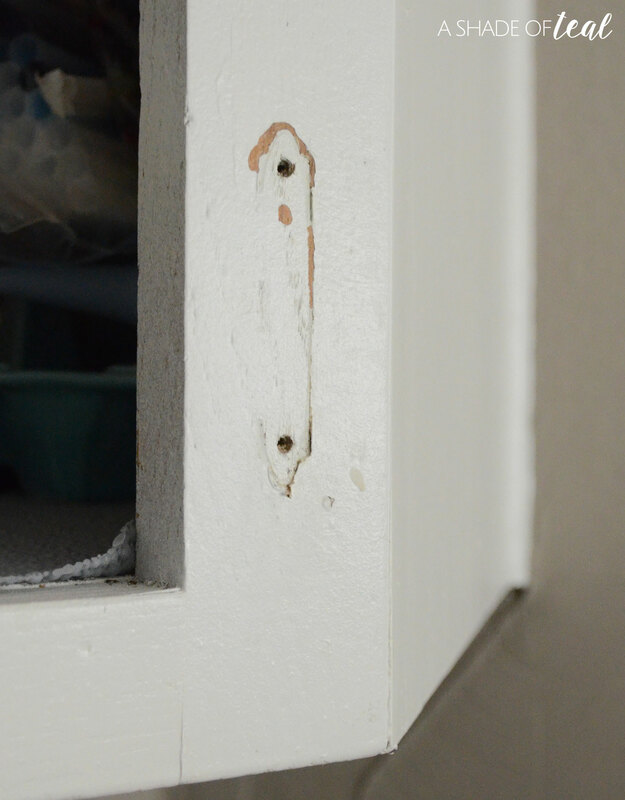 Of course this also means more prep work; I’ll have to fill all the existing holes on the cabinet base. You can see below how bad the previous paint was. When removing all the doors it pulled up some of the old paint. This just means more prep work, but in the end it will be worth it. Curtains & Accessories: Pinboard, Napkins, Wood bowl (similar option), Marble Cake stand, Marble cutting board, Curtains. Since you now know my inspiration I can share a project I started, the ship-lap accent wall on my peninsula. For past projects I have installed Faux Ship-lap, but for this project I went with actual Tongue-and-groove panels. They’re definitely harder to work with, especially if the wood is warped. I decided to only go as far as my counter, it’s hard to see in this pic but the wall continues for another foot. Once the wall went up I had a huge dilemma. What do I do with the molding? of course if I was starting from scratch I would have never added molding, but in this case I just worked around it. The wall will most likely be a aqua/teal color so having a contrast wall against white molding would look silly. So after debating what to do I decided to add an extra wood strip to act like new molding. See below. It looks so much more finished now! I still need to caulk in the seams and joints, but this guy should be painted by next week! So there is my week 2 recap! I also wanted to introduce my amazing sponsors that are helping me get this room done. That accent wall is looking great! Can’t wait to see once it gets painted! Looking great so far! 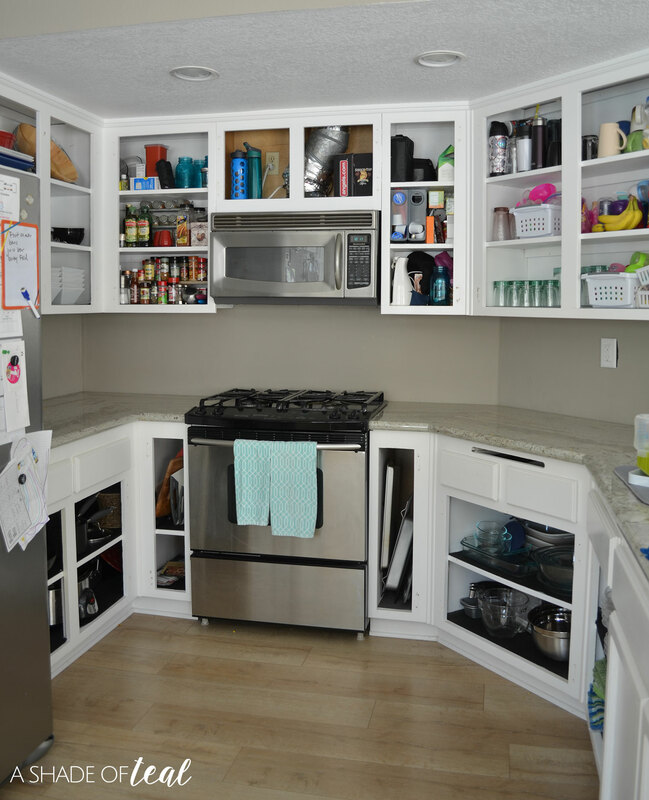 The insides of your cabinets aren’t that bad. 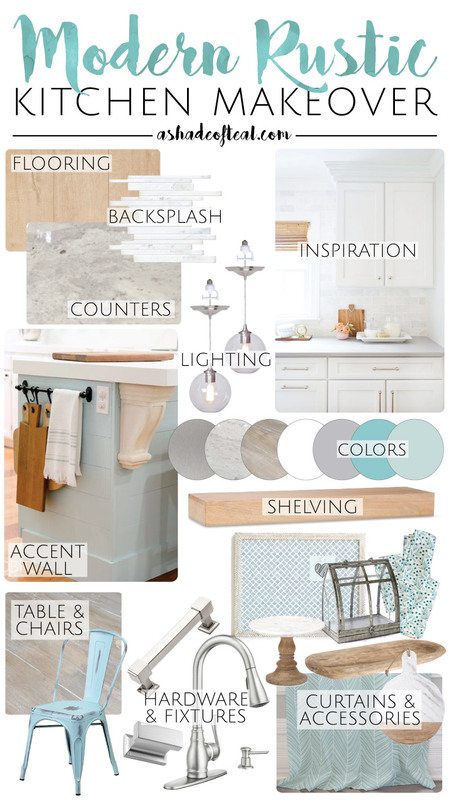 Love your inspiration board and look forward to seeing it all come together. that solution is perfect for the molding! loving how that wall looks so far and love your pretty plan! Thanks Sarah! It’s probalby the only cabinets in my house that are organized, haha!!! Great solution for the molding! I have got to show this room makeover to my mom…she loves teal! 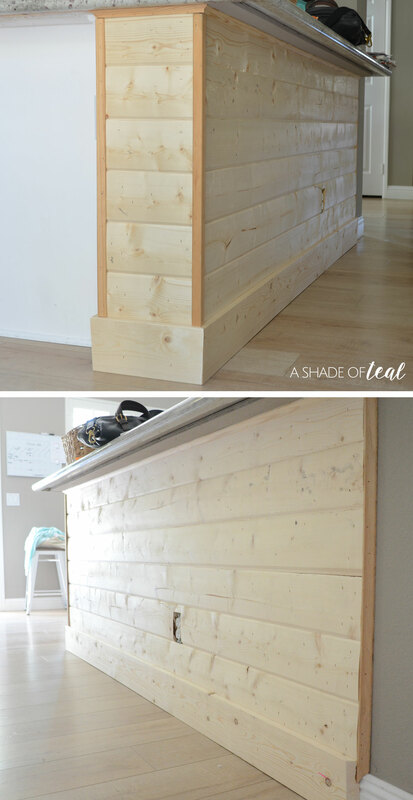 I love what you did changing out the baseboards to flow with the shiplap! I had that same issue. 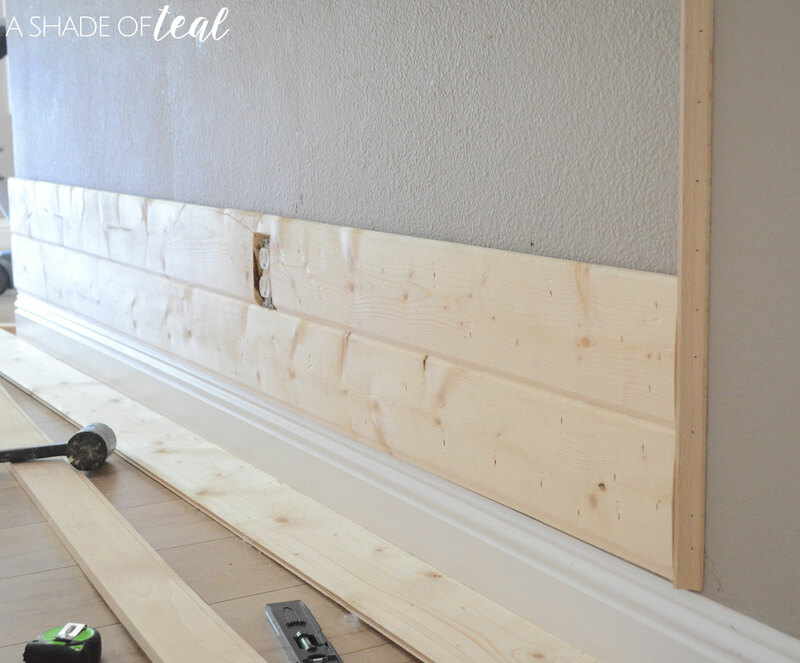 I did a big shiplap wall in my living room, and I wanted to change out the trim but it was going to be soooo much trim so I decided to put it off for a while. Can’t wait to see your final reveal. This is my first year to participate in the ORC and I am loving seeing all the progress….it’s sooo fun! I love the new chunky molding at the bottom! It’s perfect! you found the perfect solution for the molding! It’s going to look great for the style you’re after! We are doing our kitchen too—- SO MUCH WORK! Thanks Colette, and yes SO much work!!! 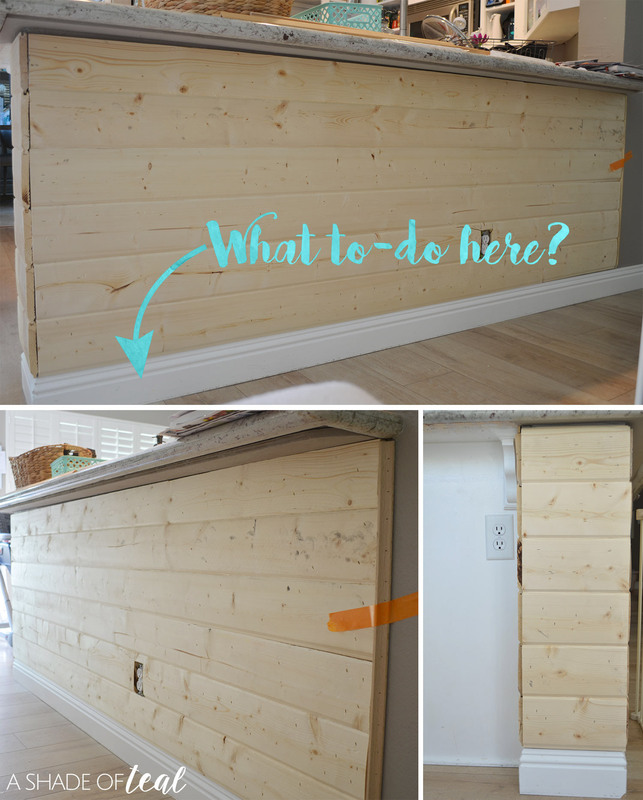 I love the way you wrapped your island in shiplap!!! I have been wanted to do something like that to my island too!!! Thanks Jennifer! It makes the space feel so much bigger. Great tips. it’s time to reorganize my kitchen and i am going to change things up!! !, but I don’t decorate. You’ve inspired me and i got over my design fears..